Menus are used to drive navigation in the UW Theme. The three most common uses for menus will be your main navigation that appears in a horizontal bar at the top of your site, the utility menu in the upper-right corner, and in the footer menu at the bottom of the page. Login to your WordPress administration site. You will see the Menu screen below. Pages: Pages you create in the Pages menu will appear here. They can be added to your menu by checking the box next to an individual Page and clicking the Add to Menu button. Posts: Posts you create in the Posts menu will appear here. They can be added to your menu by checking the box next to an individual Post and clicking the Add to Menu button. Custom Links: Custom Links allows you to create external links to put in your menus. They can be added to your menu by entering the URL and adding Link Text (this is the text that displays in the menu rather than the URL) and clicking the Add to Menu button. Categories: Categories allows you to create a link to all of your Posts in a particular category. They can be added to your menu by checking the box next to an individual Category and clicking the Add to Menu button. Menu Name: Menu Name allows you to name your menu so that it can be easily recognized when adding it to your site. The options on the left will be grayed out to start. 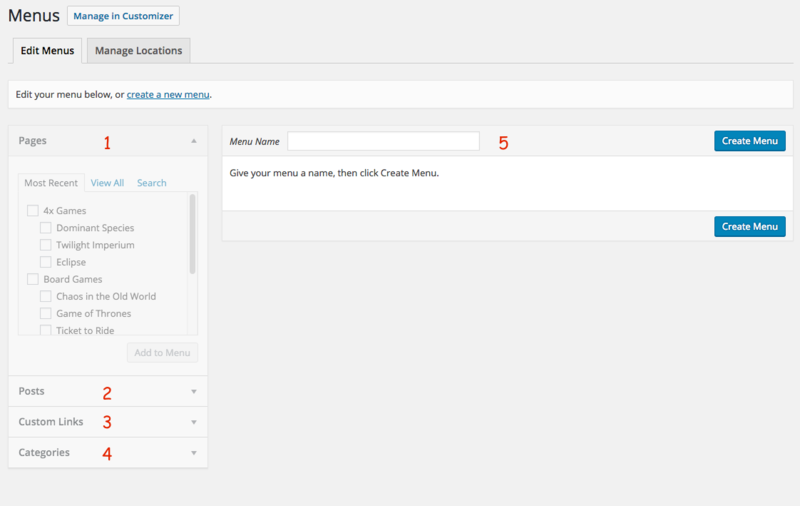 Name your menu in the Menu Name field and click Create Menu. The options on the left will now be available. 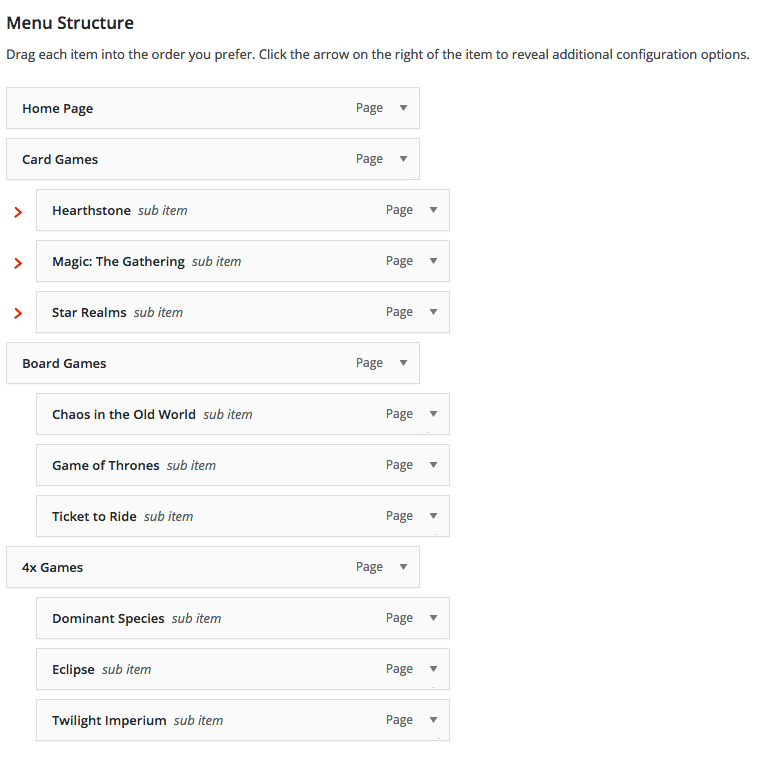 Select the Pages, Posts, Custom Links, and Categories you want to add to the menu and add them. Once all of your content is added to the menu, you can create sub-menu options by dragging and dropping menu items. All menu items start as top level options. If you want to move an item underneath a top level option, drag and drop it below the top level option. It should appear indented below the top level option. See the screenshot below. Warning! : Once items have been moved underneath a top level navigation item, the top level navigation item will not be reachable on the site. See the special Top Level Navigation section below for more details. Once your menu is configured, click Save Menu. Example 1: You have a Students page with content that you want to display in your navigation. Adding it as a top level navigation with no sub-navigation will work as you intended. The Students link will appear in your navigation and clicking on it will take you to the students page. Example 2: You have a Students page with content that you want to display in your navigation but it has sub-navigation for Schedule, Majors, and Graduation. 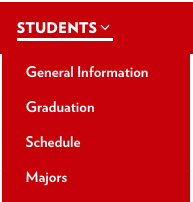 Hovering over Students in the main navigation will reveal the Schedule, Majors, and Graduation menus, all of which can be clicked on and reached via this method. Clicking on Students will have no result; you will remain on the page you are on. If you want Students to be a page that they can click on, you will want to make a Students page with no content and add that as your top navigation item in your menu. Then add the main content as a sub-page (e.g. General Information) along with Schedule, Majors, and Graduation. After you create a menu, you will see Menu Settings options at the bottom of the screen. Below is an explanation of those settings. Automatically add new top-level pages to this menu: This will add top level pages in the Pages menu to the selected menu automatically. We do not recommend checking this options unless you are a very small site, as most sites will want more control over the menus. Main Menu: Check this option if you want the selected menu to be your Main Menu. The Main Menu is highlighted in the screenshot below starting with Home, Wizard Updates, Wizard Events, Wizard Locations, and List of Wizards. Utility Links Menu: Check this option if you want the selected men to be your Utility Menu. The Utility Menu is highlighted below in the screenshot in the upper-right hand corner with the link UW Home. Once you've added a menu, the Select a menu to edit option at the top of the Edit Menu tab will become available. To edit an existing menu, select it from the dropdown menu and click Select. The Manage Locations menu allows you to quickly change your Main Menu and your Utility Menu. Click on the Manage Locations tab and select the menu you want to use for either your Main Menu or your Utility Menu. Once you have selected the menus you want to use, click Save Changes. If you do not want a Main Menu or a Utility Menu, you can leave them with --Select a Menu-- selected and the menu will not display. Adding menus to your footer can be done in the Footer menu. See WiscWeb - WordPress UW Theme - Creating and Editing a Footer.